I was in the coffee isle of my local supermarket a fortnight ago, when I made a decision that changed my life, writes Louise Bradbury. I was reaching for my favoured brand of coffee when I saw two familiar, yet spiteful faces smirking back at me. Obviously somebody somewhere had deemed it appropriate for Trinny and Suzanna to represent my brand of coffee. They may as well have added the tag line ‘laced with arsenic’, such was my desire to pick up another brand at this point. It is with a mournful resentment that I now spend my early mornings lamenting over a gritty and very bitter cup of someone else’s coffee. The point of that little tirade was to outline the importance of brand personalities. Marketing wars have been won and lost at the hands of an ill appointed spokesperson, or indeed the subsequent actions of a perfectly suitable candidate. Vinnie Jones now enjoys a rather frosty relationship with Bacardi since his little outburst in the sky, which just goes to show that even if you pick the perfect brand ambassador, there is always a chance they will mess it up for you. Perhaps this is why, for many years dogs have often been the perfect ambassadors for many a brand. As proved with Lassie, the image of a dog is renewable, and the chances of your brand spokesdog putting his paw in it are slim. But what can a dog really say about a brand? So it all must be about communicating your brand to an audience for Lycos. But certain brands would rather not communicate everything to their audience. One of the biggest brand marketing icons ever known is the Andrex puppy. Andrex spokeswoman Anna Dufty explained that identity of who came up with the concept of the puppy is lost in the mist of time. The Andrex puppy was first seen on our screens in 1972. Although today’s Andrex puppy has a rather disingenuous relationship with the product he sells, the original concept implemented over thirty years ago was to demonstrate how long an unravelled roll of Andrex would go on for. Nowadays there is a much bigger phenomenon at work, still endearing us to the brand. The ‘aah factor’ (a genuine technical term) lets the consumer build their relationship with the personality of the dog rather than the functionality of the product. Toilet tissue is what’s known as a low involvement category brand. We don’t seek to communicate to others anything about ourselves via our choice of toilet paper, where we definitely would through our choice of car or credit card. This low involvement affords the brand a certain freedom. There is no need to associate the brand or the brand icon with anything literal, which means the puppy is free to look cute. Victor Geus, Andrex Marketing Manager, commented: "We all have an emotional attachment to the Andrex Puppy. It embodies positive qualities such as kindness and trust but the puppy's more obvious appeal is its playfulness and of course its cuteness!" Andrex was the first toilet tissue brand granted permission to advertise on television. Since it’s inception, the puppy has enjoyed one of the longest running campaigns in advertising history. There is one weakness that the Andrex puppy has; it’s inability to exist outside of the confines of television. Although, many youngsters and perhaps even adults refer to all Labrador puppies as Andrex puppies, signalling the sheer power of the dog as a brand icon, Andrex’ radio and print media campaigns always lack the playfulness and innocence associated with the puppy. Music retailer HMV is another organisation that has reaped the benefits of canine branding. Born in Bristol in 1884, Nipper a Fox Terrier could not have known his naughty antics would have rendered him a cultural icon over one hundred and twenty years later. Owned by Mark Barraud, Nipper got his name because of his fondness of the ankles of visitors to his home. Upon the death of his owner, the little dog was taken in by Mark’s brother Francis. An artist and music lover, Francis captured the enduring image of little Nipper cocking his ear to a gramophone which was playing a piece of music that his first master had enjoyed. Entitling his painting ‘His master’s voice’, Francis treated the work as a tribute to the loyalty of the little dog, who still remembered his late brother. The painting was eventually sold, with reproduction rights for £100 and now takes pride of place in the head office of record company EMI. Along the way, the image was reproduced many times, accompanied by the caption, and upon expanding into music retail, the His Master’s Voice brand, which we know today as HMV has become an iconic figure. The image has become so iconic that HMV now associates much of it’s marketing with the original picture. ‘Top dog for music’ being the current slogan, is a direct reference to the painting created over a century ago. The fact that HMV still builds its brand identity around the picture is testament to the strength and endurance of the image and it’s associated connotations. Churchill the Nodding Dog was developed in 1993. He was developed for Churchill Insurance by Julian Borra. Julian is part of brand agency Elliot Borra Perlmutter. Greg Dawson, Head of Public Relations at Churchill Insurance, says: "With eighty nine percent consumer recognition in the UK, Churchill the Nodding Dog is one of the country's favourite brands and extremely successful in communicating our passion for value and serving customers. Independent research has also shown that Churchill is one of the most popular canine personalities in the UK, ahead of cartoon characters such as Pluto and Gromit. Churchill is often described in human terms; he is very characterful and straightforward in a way that is very appealing. There's an element of fun in Churchill that makes him very approachable - we find children respond strongly to him - while at the same time his solidity communicates the reassurance people appreciate from their insurance cover. In research people express strong opinions about what the Churchill character would and wouldn't do; his human qualities clearly resonate and promote a close connection with him." It’s a wonder not every brand is fronted by a dog; with humans interfering it can always go wrong. Sainsbury’s 1999 advertising campaign featuring John Cleese was a monumental reminder that adding a celebrity to a campaign does not always guarantee success. With the ‘something to shout about’ tag line, which in turn gave us adverts showing Cleese shouting at staff, the adverts were a huge turn-off. Sales swiftly dropped and staff complained about their portrayal in the adverts. Cleese was dropped and it was up to Jamie Oliver to pick up the pieces. Soft drinks brand 7-up demonstrated foresight and enterprise when they came up with a campaign to piggy back on the 2002 world cup in Japan and Korea. Getting the former Manchester United and Ireland captain Roy Keane, who they were banking on being a star in the tournament, to endorse their brand cost them dearly. Before he had even found a ball to kick, Keane was sent home following a well publicised bust up with the Ireland management. Keane was vilified by the English press upon his return and his association with the drinks brand ended. Camelot chose comedy legend Billy Connolly to promote the national lottery. Although there was no scandal surrounding the Scotsman it was a classic case of choosing the wrong man for the job. Camelot failed to predict that the lottery ticket buying public would not appreciate being told what to do with their hard earned money by a millionaire with a purple beard. This campaign was heralded as one of the worst celebrity endorsements of the decade. Footballer turned actor Vinnie Jones enjoyed a rather prolonged flirtation with the drinks brand Bacardi. This coincided with the Hollywood hard man’s air rage incident in which he informed a fellow passenger that he ‘could have him killed for three grand’. Upon leaving the court where he was charged, Jones was harangued by anit-Bacardi protesters. Another comedian to besmirch the brand that feeds him was ‘fast show’ and ‘cold feet’ star John Thomson. Lloyds TSB appointed the loveable northerner to appear in a series of adverts just in time for revelations about his drink problems and his personal turmoil to hit the tabloids. American food retail giant Taco Bell is just as famous for it’s corporate mascot as it is for it’s market dominance. The Taco Bell Chihuahua, also known as Gidget in TV commercials is one of the most controversial dogs in marketing history. Taco Bell was taken to court last year amid claims that they were not the legal owners of the copyright governing the idea of the talking Chihuahua. Joseph Shields and Thomas Rinks claim to have pitched the idea of a talking Chihuahua to Taco Bell in 1997 at a trade fair, one year before the company started using the dog in their television commercials. The two men, both from Michigan claimed to have developed the concept of the ‘Psycho Chihuahua’ whilst Taco Bell maintains that the idea was proposed to them independently by the advertising firm TBWA-Chiat-Day. 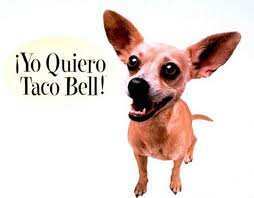 The campaign featuring the little dog raised huge awareness of the Taco Bell brand and led to huge sales of merchandise featuring the Chihuahua. Eventually it was proven that the Chihuahua was indeed the creation of the two men from Michigan and they were subsequently awarded substantial sums of compensation. Despite this episode, Taco Bell still uses the Chihuahua as their brand mascot. This is not the first dog in branding to cause a stir. Walls sausages came up with a way to ensure that their brand got talked about. The very simple ‘Walls’ catchphrase would have failed to do so had it not been uttered by a fictitious dog in what came to be his trademark growl. The dog, who spent a portion of his televised existence as a computer generated animation, became associated with the brand through his tireless attempts to relieve his family of their sausages. However, an ad campaign that saw the dog, known as Grizzler defeated by his owner in a vicious, yet comedic fight scene involving the sausages. The ad attracted complaints from numerous animal welfare campaigners as well as complaints to broadcast regulator OfCom. Dogs can sell everything, from pet food to....BEER! My grandad came up with the idea of using a labrador puppy for Andrex, but Anne Duffy says the identity of the person who came up with it has been lost over time?! The growing demand for dogs in advertising is a great way to promote the special relationship between man and his best friend. You totally forgot the Dulux Dog. be it pharmaceuticals, houses, security systems, womens sneakers, automobiles, and the list goes on. Ad agencies are SUPPOSEBto be CREATIVE…..well COPYING everybody is NOT being CREATIVE ! DOGS are now Overdone, OverKill and BORING now ! Get a new perspextive, AD people….